There are many ways that Texas Longhorn cattle can be profitable over conventional generic breeds. It has been a long established fact that you can run 4 longhorns on the same amount of grass as 3 generics. The Longhorns will eat more brush, tree leaves, cactus, briars and low quality fiber and retain good body condition while doing so. This is a special profit trait where brushy pastures exist. This Multi floral rose bush had never met a Texas Longhorn before. 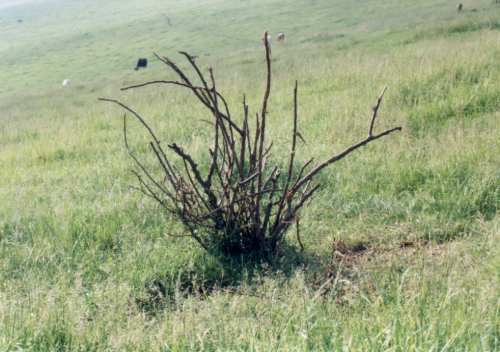 Longhorns ate the leaves, thorns and flowers completely off. Thats no problem for roses. The next year they grow right back. This is the same rose bush the second year. It tried to re-grow and Longhorns ate it again even when there was plenty of excellent grass available. 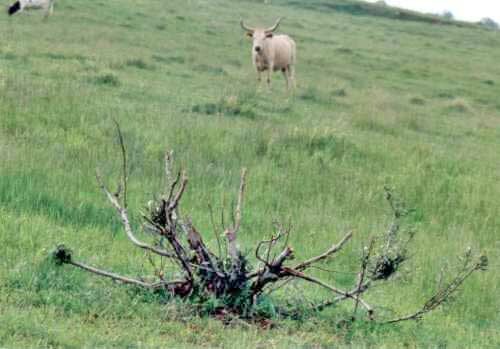 Texas Longhorns are natural browsers. They enjoy coarse fiber that more pampered cattle breeds pass by. 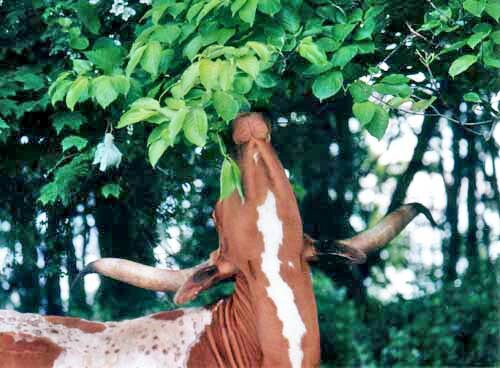 Longhorns will eat more weeds, brush, and low value foliage than any other breed. This is a true economical plus for extra profit.